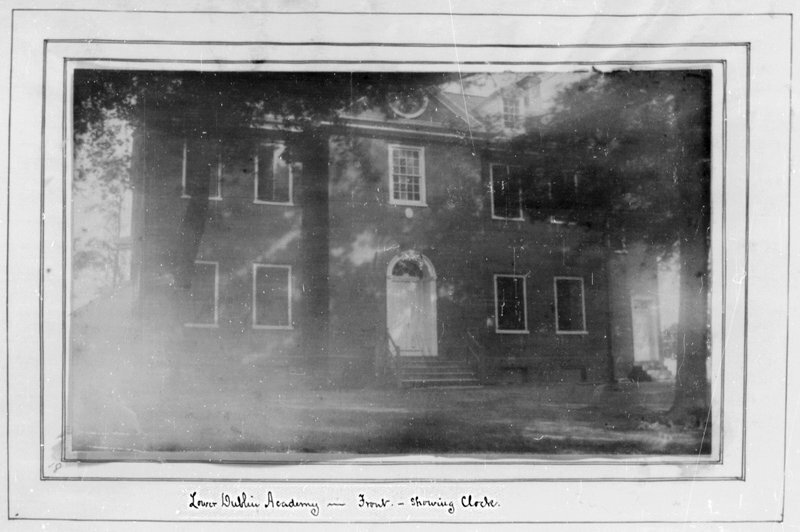 This is the earliest known photograph of Lower Dublin Academy. 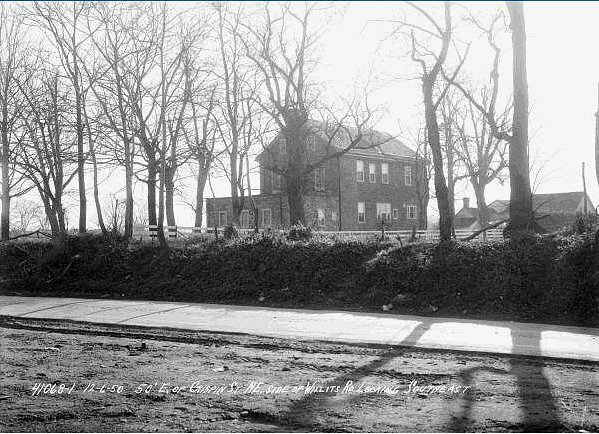 The caption from Samuel Willits 'History of Lower Dublin Academy' reads 'Lower Dublin Academy - Front - Showing Clock'. The referred to clock is the famous double-faced clock made by Edward Duffield at the suggestion of his efficient-minded colleague Ben Franklin who was upset at people coming to him to ask the time. The clock hung from a second story window at the front of Mr. Duffield's shop at the NW corner of Second and Arch Streets where it served as the first standard public timepiece of Philadelphia. 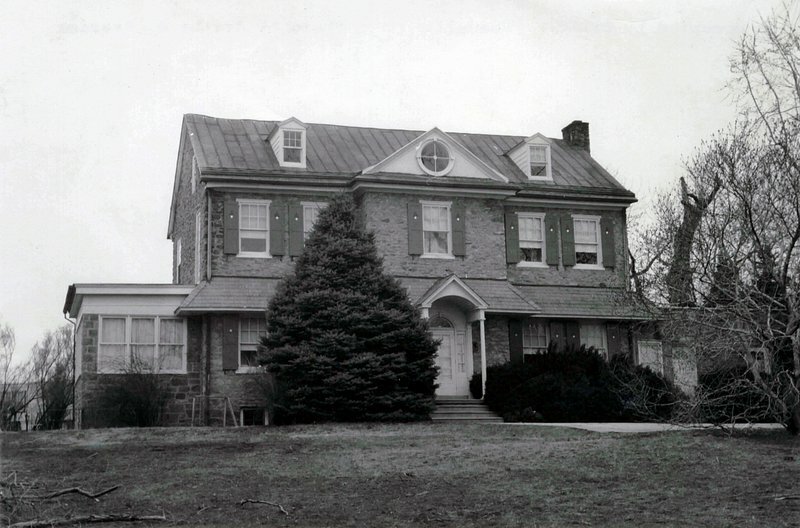 Mr. Duffield lived at the family estate - Benfield, named by his father Benjamin Duffield - near today's Christ the King Church in Morrell Park. He was the first president of the Trustees of Lower Dublin Academy in 1794 and donated the clock to the Academy when the building was completed in 1802. It was placed in the round dormer window opened especially for it. The clock ceased working at some point and was removed. It was repaired and returned to it's dormer in 1875, thus the approximate date of the photo. Here's a photo 100 years later - 3/10/1975. 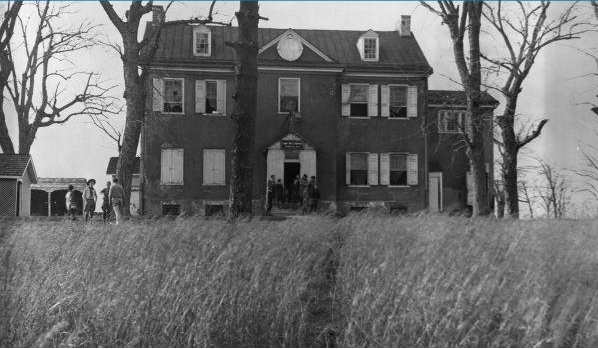 The building became a private residence and the stone side extensions were added some time after the photo below, taken in 1938. A troop of Boy Scouts were apparently using it as a meeting hall. 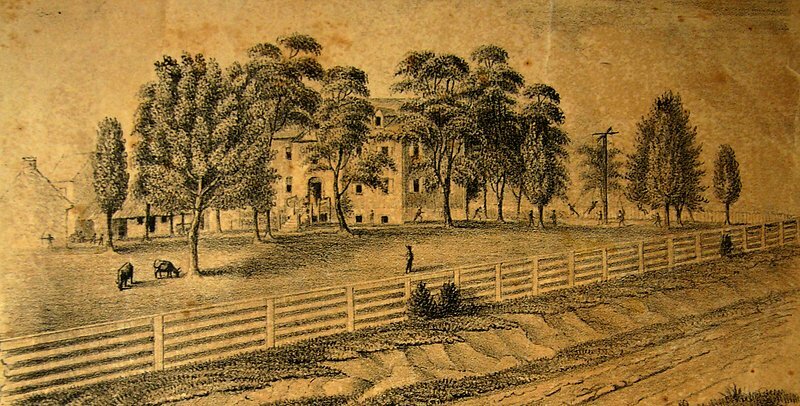 The exterior stair well that had been added to the north side (right side in photo) in 1840 was removed. Below is a photo taken 12/6/1950 from across Willits Rd in front of where the new Thomas Holme Public School would open in 1952. The low structure at the far right is the circa 1940 garage, still standing. The low structure with the chimney, between the garage and the old Academy building, is the original log school house from 1723. It was still standing in 1954. 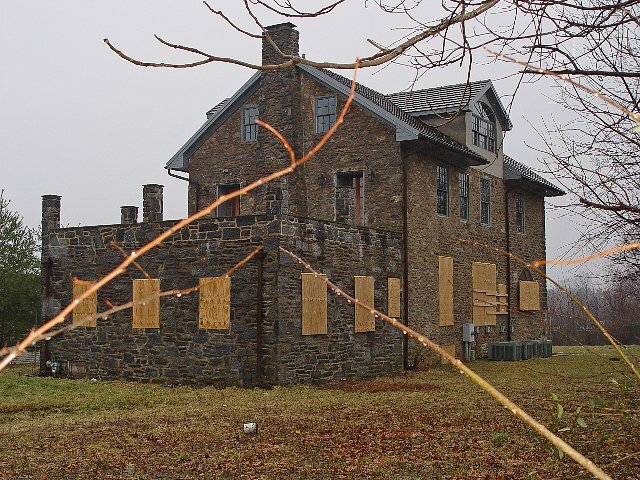 Below is a photo taken February 4, 2006 about 5 months before the July 2006 fire. There had been an earlier fire in 1994 set by 4th of July fireworks that considerably damaged the roof and upper floors. As part of the most recent 2000-06 renovation, the top of the stone wing that had been added circa 1940 has been raised about 2 feet and the top pillars added and the rear dormer enlarged.